The thread's title is missing this -> D <- right here. Anyway, please post any feedback to the script here, so I don't have to keep track of the PQs. If you are on this list and have not received it please PQ me. Energize: Black - New story updating now!! You potrayed my character well and I loved the script. My PQ system, for some unknown reason, does not work. Please EMAIL me the script instead. Nepath & Mr Hades: Thanks! BlueBeacon: I'm really glad you feel that way, since Blue Beacon is the character with which I took the most liberties. I tried to stay true to your concept, but move away from the similarities with Green Lantern (i.e., no blue-light constructs here), trying to give him his own distinctive voice. I like it. I like all the Tech stuff, there isn't really a problem with characterization of my characters, plus there's a ton of cool robot stuff. I'm cool with this. ironhand: Hero agreed to color your work, since you offered to do only lineart in the details thread; but I'm sure he won't complain if you'll color your art yourself. It's up to you. AzuJOD, Hero, SympleSymon: Thanks guys, glad you like it! Actually, if hero wants to color my work he can, just thought i could save someone a job but i do like seeing my art improved through someone else's coloring skills. Well really you didn't have him there long but I like the whole monk buddist attitude thing you had with him. What powers did you give him because I didn't know you wanted to change his powers? ironhand: Let's see what hero thinks about this. BlueBeacon: For me he's definitely the decisive character in the story, and by using his Buddhist background I was able to even give the satellite some “character moments”. Concerning his powers: I didn't really change them, I just didn't use them in a characteristic way (we'll only see him flying). BTW, I just drew the redesigns for Blue Beacon, color versions should be up by the middle of the week. Ok well I love how you had him use his mind to solve the problem, not his fists. Very cool thinking. 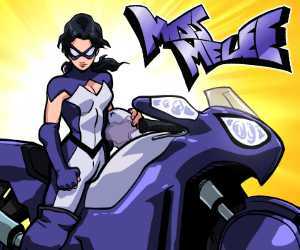 Al Schroeder of MINDMISTRESS http://mindmistress.comicgenesis.com—think the superhero genre is mined out? Think there are no new superhero ideas? If by that you mean if there are any personal facts about her: Nope. Of course, anything someone does tells us something about that character, but in EGO her role is just to coordinate the missions - there's a scene where she doesn't seem to happy about Bombshell wanting to take over the guidance of one of these missions, but I figured that's pretty natural if you're assigned commander. So I'd say nope, there's nothing you'd have to take into account. Hey, is it all right if I make some general comments on the story, now that it's finished? A very interesting story, but we didn't see some things that would have made it even stronger…. Rereading the whole thing, the Blue Beacon thing at the beginning definitely ties in with the end, and kudos for that. It would have been even stronger if we had seen Blue Beacon more during the action—perhaps thinking to himself, “They're confronting when they should be talking. It's intelligent in some way…” Just enough to remind us of his Zenlike nonviolent stance, maybe even a disagreement with a more hotheaded member. That would have developed the character and better yet, REMINDED us of what made the character special. By the time the ending rolled around, I had virtually forgotten Blue Beacon's zenlike contemplation at the beginning, so it almost seemed like you were bringing in those character traits from left field. Since this ISN'T a Graphic novel to be read in one sitting, you have to make sure you're constantly reminding the reader of the salient plot points. Like old-timey newspaper adventure strips in pacing. Not a criticism, more like an observation/tip. I think the cast was MUCH too large. Blue Beacon, Flea, Unca Sam and the kid, Acrobat, Titan and maybe Dasien were all that was really needed in the action teams, with Bombshell and the Commander coordinating. What you gain in spectacle with a large cast you lose in space to develop character. I think it would have been a stronger story with a smaller cast…you might keep that in mind for future HU scripts. I also would have enjoyed seeing more from EGO's POV, and what it was thinking, how it contacted Motherboard, etc. I can understand it not wanting to be shut down, but raining missiles on us to keep that from happening doesn't SOUND like the sort of personality Blue Beacon could talk into moving on without a lot of groundwork being laid. But since we knew so little about Ego and its viewpoint, one can't say for sure. All this is IMO, of course, and your mileage may vary. There were some really good sequences—the Commander and Bombshell (for once, dressing like a human being) trying to see who's the alpha female, Unca Sam being summoned, Blue Beacon talking Ego down/away…I just think that all writing is a learning process, and as good as it was, it could have been even BETTER. No story's perfect. Still, a very enjoyable story. A little bit more character developement, a little more foreshadowing as you go along, a bigger focus on just a few characters—that would have made it even BETTER, but my kudos to you for geting through this and for the final product. —Al, who used to be a comic book letterhack, under the name “Al Schroeder III”…can you tell? First off, what's important to me is to improve, not to be perfect. I don't think my writing or artwork can be measured according to some abstract ideal of what storytelling should be. Rather, I am happy if my work today is better than my work yesterday, and I'll also try to make that true tomorrow. There were some dialogues which in the end were cut out, not because I thought I couldn't afford to keep them in (I did expand the story to 36 pages after all, and I could have expanded it even more) - I do think that I arrived at a nice, fitting length for what I had to tell. But I felt that some things were redundant, and I didn't want to do more than hint at them. Most of these were things Blue Beacon or EGO would have said, and which would have explored their own reasons. (Like, why would EGO resort to attacking using his missiles? Well, in his own words: “What other purpose do I serve?” It's what he does, it's what he “knows”.) I'm happy to let the reader fill in the blanks. For my purposes, hinting at these characters' reasons was enough. What was important to me was that what Blue Beacon said to EGO wasn't just spirtual mumbo-jumbo, but that it had a true core that would be grasped by a purely (and very simple) logical apparatus: That EGO's life-span is finite. Since this ISN'T a Graphic novel to be read in one sitting, you have to make sure you're constantly reminding the reader of the salient plot points. Like old-timey newspaper adventure strips in pacing. That's an interesting point, because in fact I did approach this exactly as if I were writing a graphic novel. I'm not a webcomic writer, naturally. But you're right, so I'll keep this in the back of my head. I think the cast was MUCH too large. Again, you're right, but in this case I think we had good reasons to include all the other characters, even if they didn't contribute much to the plot, or were even detrimental to the reader's orientation. Because this is exactly what this project was about: including as many characters as possible. This is about as important as a neat story - it's an event. Bringing together different webcomic characters is not (just) a means to telling a good story, but an end in itself here. That's not a defense of the script (as it clearly could have been better), it's an explanation of why I made these decisions. The “internal” explanation should be something like: The HU Commander wanted to have as much manpower on this mission as possible… even if some of them turned out to be standing on the sidelines in the end. Thank you! From my POV, I am happy that I was able to sneak in a bunch of “character moments”, and that the cast is not interchangeable where it counts. The plot is the way it is because the characters are the way they are.